This episode was produced in collaboration with KUOW and made possible by a generous grant from The National Endowment for the Arts. Various Voices: From WYPR and PRX, it's Out of the Blocks. This is the CID, the Chinatown International District, Seattle, Washington. One neighborhood, everybody's story. We are on the south end of downtown, where all the athletic stadiums are. It's the oldest part if the city. We are a historic district, but on the fringes there is a lot of development happening, so I think you're going to see a renewal and hopefully some of the influences of the small community we have here... You know, it's nice, you walk down the street, you say "hello" to people... Hopefully that will not be overwhelmed by the development. There is change coming around the neighborhood. It's an interesting balance. I think it’s... the neighborhood's in a precarious place right now, where it's like, "How much do we hold on to tradition and honor the past?" But how much do we need to move forward and keep up with what everyone else is doing? 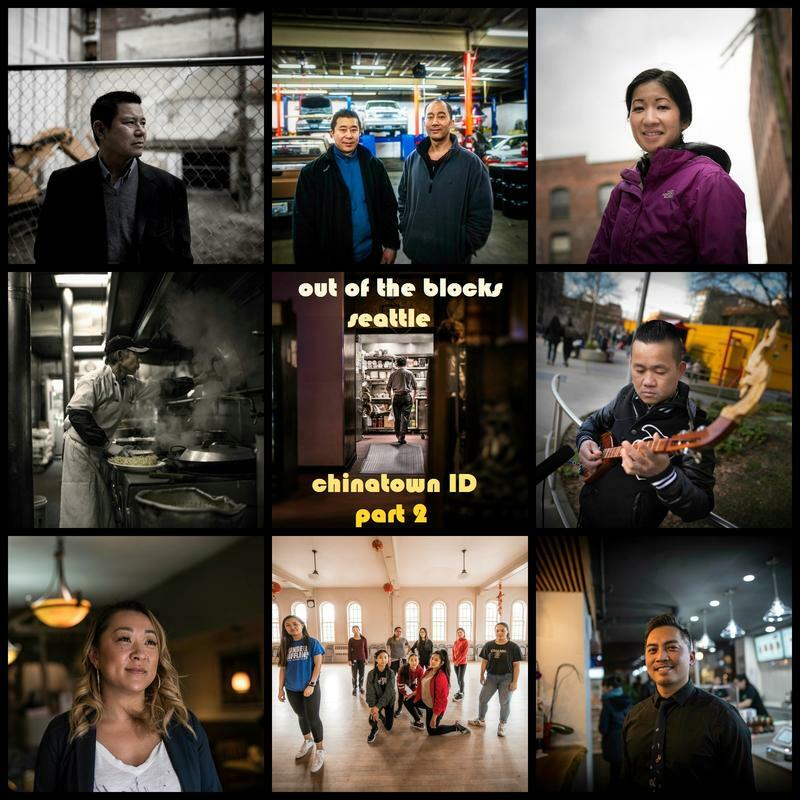 From the minds of Aaron Henkin and Wendel Patrick, in collaboration with KUOW, it's Out of the Blocks, the CID, Chinatown International District, Seattle, Washington. 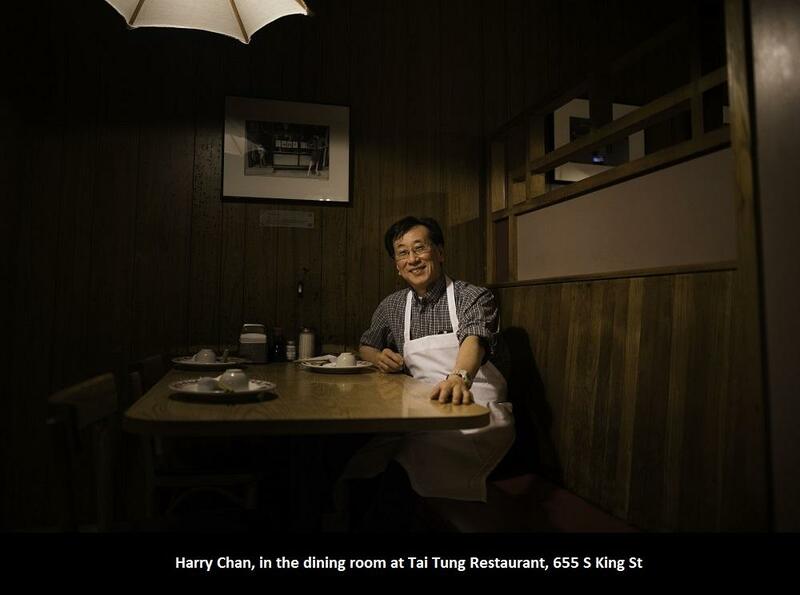 Hary Chan: My name is Hary Chan. We are right in the heart of the Chinatown, Seattle, Washington. 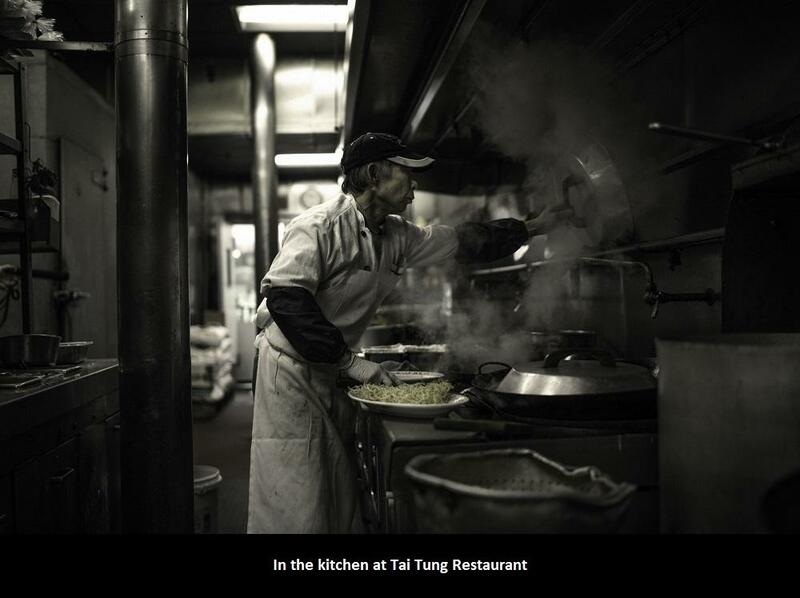 The restaurant is called Tai Tung Restaurant, and the restaurant started with my grandfather since 1935. 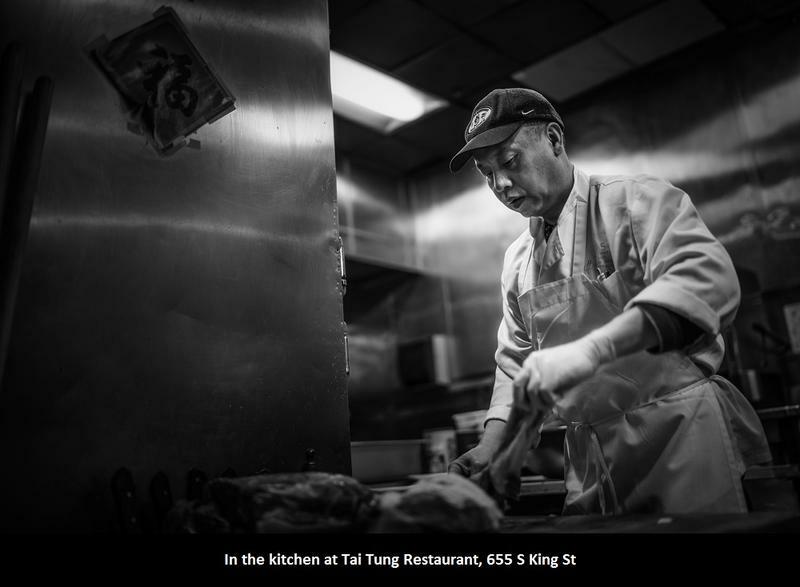 Aaron Henkin: The name of the restaurant is Tai Tung? AH: What do you know about your family's story, and your grandfather's story, like how did he come here? HC: Well, during that time, there was a lot of people from Taishan come to United States to look for the work, doing the railroad, gold rush. Of course, up to that gold rush, you know, they have to make a living, so that's why they start with business like restaurant, laundry, and grocery stores. AH: So your grandfather came over when the West was about railroads and the gold rush, and then after that, the jobs were... you say laundry, grocery, restaurants. HC: Yes, that's the main three major businesses. AH: So, your grandfather ran this place? And then your father? HC: Oh, my grandfather started, you know, and then my father, and my brother, they came over in China, then my children, and now, you know, I have grandsons working here. Basically, we have a five generation here. 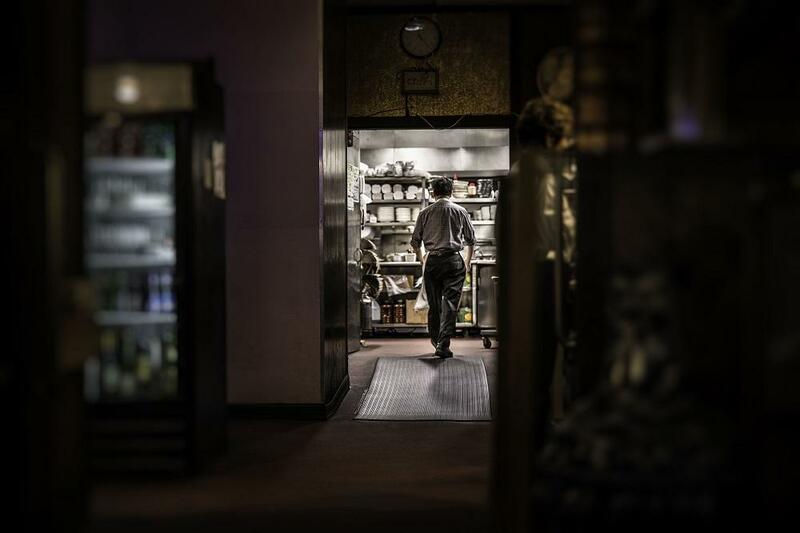 AH: Do you think your children and your grandchildren will take over this restaurant? HC: I don't want to speak for them. We'll just wait and see. It is up to them. AH: Tell me more about your dad. What kind of a man was he? HC: He's a pretty quiet man. Even though we see each other, we spend a lot of time in the restaurant, we really don't have the opportunity to sit down and really talk about things, and that's why I feel bad right now, because I can't talk to him anymore. HC: Over twenty years ago, yeah. AH: It must have been something that made him proud, a great comfort to him, to know that you were going to be taking on the restaurant, right? HC: Well, I think he's... he should be happy the way I keep up the family business going. You know, they ask me, "How long do you want to keep the business going?" You know, and I tell them that as long as I'm here, the door's open. Paul Murakami: Sanzo, the mother, Aya, Kay, and Masa and Chiyo. They all ran the store. And yeah, the store was her life. I am Paul Murakami of the Murakami family that established the Higo Variety Store in the Jackson building, which they had built in 1931. It was the main variety store. It sold everything. Provided a lot of goods for the Japanese community in and around Nihonmachi, or Japantown. They sold everything, from expensive kimonos to dishware, rice-cookers, toys. Masa would always enjoy kids because none of them married. They didn't have any kids, so basically, the cousins and relatives were their family. So, every time we'd come down here, you know, they'd give us candy and we loved it, but the candy...I can't even tell this story....the candy would taste like moth balls, because some of the candy was pretty old and they used a lot of moth balls for a lot of the fabrics. So, everything was stored in moth balls. Even to this day, the warehouse has a faint smell of moth balls. I threw away as much of the moth ball cases of moth balls, but it was still lingering. So, every time I smell that, it reminds me of my family. Recording: When the Japanese attacked Pearl Harbor, our West Coast became a potential combat zone. Living in that zone were more than 100,000 persons of Japanese ancestry. We knew that some among them were potentially dangerous. That is why the commanding general of the Western Defense Command determined that all Japanese within the coastal area should move inland. Behind them, they left shops and homes they had occupied for many years. PM: They maintained the property, even during internment incarceration periods. So, they kept the property and that was very unusual, very fortunate for them. Fortunate for me, to have the privilege of preserving the building. Recording: Now, they were taken to race tracks and fairgrounds, where the army almost overnight had built assembly centers. They lived here until new pioneer communities could be completed on federally owned lands in the interior. PM: The family went to the fairgrounds, that was the holding site before they went to Minidoka, Idaho, and the building was just vacant. They hired a security guard to kind of watch over place, but you know, we're very, very lucky that the place was not vandalized. It was intact. All they had to do—they boarded up all the windows, but when they came back, they had a crowbar and they just opened up the windows, and it was back to business. Recording: We're setting a standard for the rest of the world in the treatment of people who may have loyalties to an enemy nation. We are protecting ourselves without violating the principles of Christian decency. PM: They never complained to me about the incarceration. But when our generation thinks about what the rights they lost, and they were, you know, illegally imprisoned, makes us upset and angry. But, you know, they're just different. They just...they came back from camp, they were not bitter, they were not angry, they just resumed. I mean, it was just a small set-back for them and they just got back and worked harder. The floor's original. I had it refinished. All the woodwork is original. This linoleum, my uncle told me that's off a battleship if you can believe it. It wears like iron. This is original. Well, I'm just a steward of the building for the family, but I hope that when I pass it on or when my family passes it on to the next generation, I'm going to stipulate that they cannot sell it, they have to preserve it as-is. I mean, I want this hallway to look like this hallway, and the exterior to look like the exterior for the next hundred years. Unknown: Phnom Penh special rice noodle. Dawn Ung: So, our Phnom Penh noodle special, it's our noodle soup, it has prawn, calamari, fish cakes, ground pork, sliced pork, and fish balls. Another one that's popular is the Battambang noodle, pickled cucumbers, a hard-boiled egg, rice noodles, with steamed sprouts, and roasted garlic and our lightly sweetened soy sauce that we make, topped with green onions, cilantro. I tell customers when they mix up that dish, if they haven't made a mess around the table, they haven't mixed it well enough. 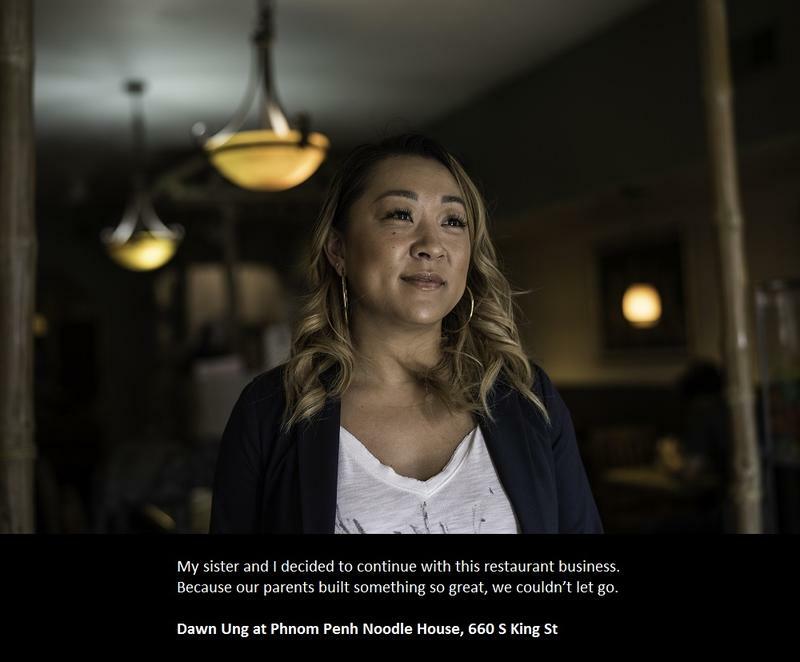 I am Dawn Ung and this Phnom Penh Noodle House, located at 660 South King Street in Seattle. My parents started this place, emigrated from Cambodia. My dad worked various jobs before opening the restaurant, and I started working at the restaurant at the age of six. We didn't have a dishwasher at that time, so we hand-washed everything, dried dishes, waitressing. By nine, my weekend jobs, summer jobs, vacation jobs, I was always working. I thought I was a slave for a while until I got older and realized my parents were trying to teach us, you know, family. We take care of one another, and it feels good now, knowing that I was there, because they definitely needed it. Well, they were in the war, and survived being in the camps and my mom doesn't talk about it. She just kind of suppresses it and it's her way and it seems to work for her. My father, he wrote a book several years back, I Survived the Killing Fields, so that is when he shared with us, and we kind of read it through his memoir. AH: Tell me about some of the moments in that book that impacted you the most. DU: It's just their way of trying to survive, and starving, and being tortured, and I would have never known unless he shared that. I had no idea, growing up, too. I never knew why my dad was so overprotective and I am so grateful to be his daughter now. They've done really well. They've left a legacy and we are so respected and it is great to know. AH: Is this what you hoped and imagined and planned for your life to turn out to be? To be here and running your parents' restaurant. DU: Absolutely not. Like, starting at the age of six, I hated it. But in 2008, my parents were thinking of retirement, and what would we do? Would we sell or would we continue? So, my youngest sister and I decided, I mean, we'd just continue with this restaurant business because it built something so great that we couldn't let go. AH: Your parents must be pleased and proud to know that this place is continuing on, now that they've retired, and that it's continuing on as a family business. DU: I sure hope so, yes. 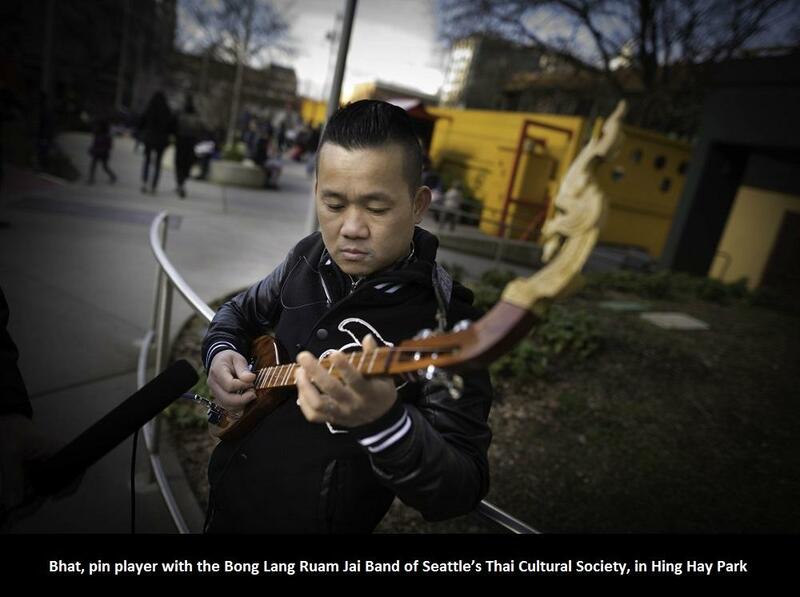 AR: My name is Alex Rolluda, and we are in the Chinatown International District of Seattle. AH: We've walked around the corner here of King and Maynard Street and we're standing in front of the Eastern Hotel, which is a project that your architectural firm has worked on. AH: This project was more than a professional project for you. There was something personal in it, as well, right? AR: That's correct. Early 1900s, Filipino pioneers came to Seattle. My father was one of them, and one of the first hotel where he lived at was this hotel. AH: Tell me what you guys did here. AR: Renovated the building. Low-income housing on the upper levels, and then renovated the lower floors for—now there's a café, there's a pinball museum, and an entrance to the lobby space. My father, when he came here, he came here for a better life. 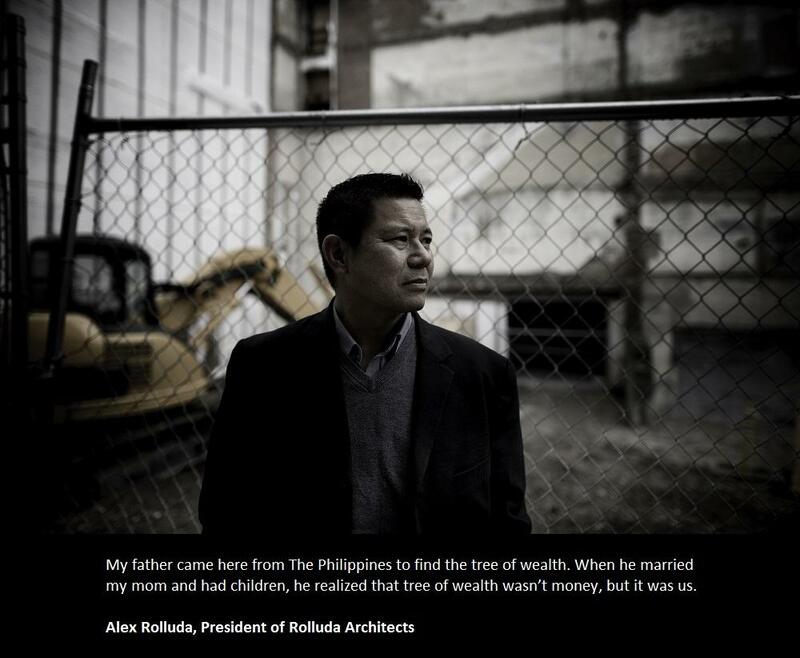 They came from a fishing farm village in the Philippines, and he came to Seattle, and his vision back then was that he would, as he said it, find that tree of wealth. Eventually, when he married my mom and had children, he realized that tree of wealth wasn't money, but it was us. I have two other siblings, and my dad retired and lived in the Philippines. But when we went to college, he would come back out of retirement and take us on his crew to work in the canneries of Alasksa. So, each time one of the siblings was going to college, he would come back and on the summer times for two to three months, work up in the canneries. And then after that, he'd go back to the Philippines. It made me appreciate the hard work. Here I am—young, twenty-year-old, working side by side with my father who is in his seventies. You know, he's sliming, cutting fish. I'm what's called a can-catcher, I'd be at the end of the line, putting the cans in a tray before it goes into the oven or the retort, and I'm trying to keep up with him. He lived until he was eighty-seven, so he saw me graduate from the University of Washington in a masters program in architecture. He saw one of the first projects that I had designed, and it was a middle school in White River, in south Washington, near Mount Ranier, and I took him to the ribbon-cutting, the opening, and my dad at that time was in a wheel chair. One of the neatest things that my dad was able to experience was that when we took him to the school—and I didn’t tell the parents that I was the architect—and the kids were running around, and one of them told his mom in front of my dad, "I love this place. It's like home." And my dad heard that, and he looked up at me and nodded, like, "Well done, son. You've done well." AH: Now, you've gone on and remodeled, redesigned, and brought back to life the hotel where he and his contemporaries came and first stayed when they landed in the U.S.
AR: Yes. That's...You know, I didn't think about that until you mentioned that, but you're right. It is something that means a lot to me because of the people that lived there. My manongs and manongs. And, you know, it's like coming home, you know? 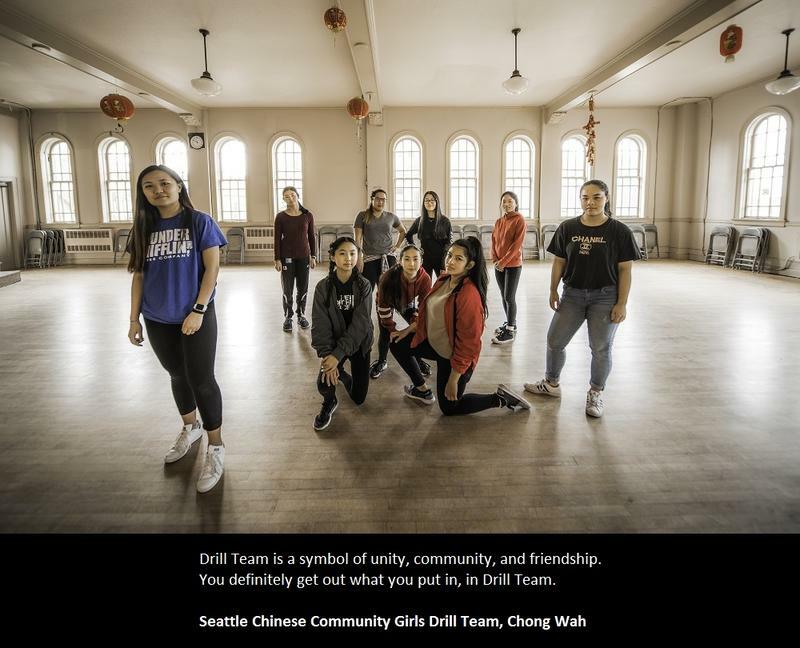 Multiple voices: Seattle Chinese Community Girls' Drill Team. We are in the Seattle Chinatown International District in Washington State. We're all sisters, even though we vary in age, like from ten to eighteen, and for me, drill team is sort of a symbol of unity and community and friendship, and you definitely get out what you put in in drill team. Isabelle Gonn: My name is Isabelle Gonn. SME: And my name is Sue May Eng. 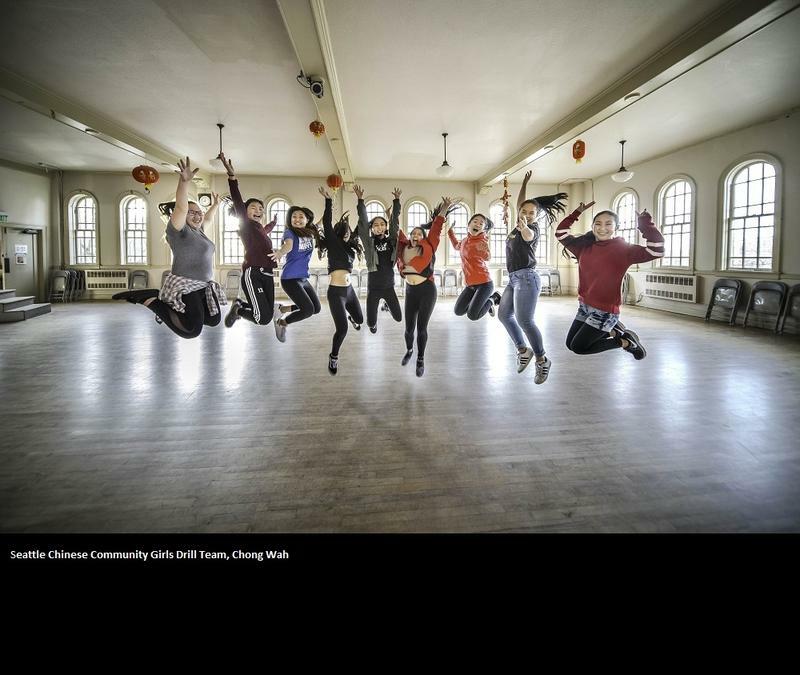 A long time ago, when there would be celebrations like primary Chinese New Year's coming up, the Chong Wa Benevolent Association would have a celebration in the community, and what they would do is send money to San Francisco to bring up a dragon team and a marching unit for the celebration. And after a while, some of the older girls in the community started to ask, "Why do we keep sending for them to come here? Why can’t we do something like that ourselves?" So, at the time, Ruby Chow, she was a community leader, went on to be on the King County Council here... There was a group of girls, high school age, called the Chi-ettes. They're the ones that approached her. 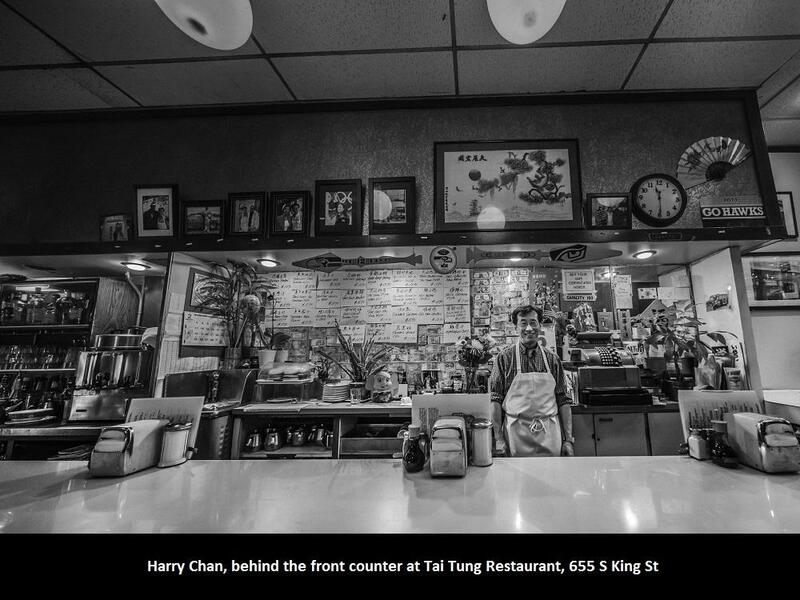 Ruby Chow had the first Chinese restaurant outside of Chinatown, up on Capitol Hill. She knew a lot of politicians and influential people, including the Seattle Police Department. So, she asked one of the police officers, at that time they had a marching drill team, so she asked him if he could come down and teach these girls how to march, and that's where it all stems from. So, this is the Cantonese Woman Warrior costume. You have a blousey silk top. The skirt is in several panels, the beads are attached. It makes a lot of movement. You've got what we call the armor. This headdress here, it's very heavy. It needs to stay on tight, because as the girls turn, they snap their heads to keep the line straight. So, we’ve got tassels that connect here. The officers wear pheasant feathers about six feet long, and the length of the feathers denote the rank. So, the longer the feathers, the higher the rank, so the captain wears the longest feathers. AH: You've got this beautiful red fabric. It's embroidered with thousands of gold sequins. You've got these amber crystals all over it. You've got these pearls, these red tassels. Talk to me about how you feel when you put on that uniform. IG: I always call it the magic uniform. I think when the girls perform in that, if they're not doing so well in practice, if they put that uniform on, something happens, and it's magical. Bhat: My name is Bhat, like a Batman. I'm the Batman. AH: And tell me this instrument you're holding right now. B: It's pin. We call "pin" from Thailand. AH: It's called a pin? B: "Pin" like a pin. P-I-N.
AH: Yeah. Looks a little bigger than a ukulele, but yours is an electric with an amplifier. B: It has three strings. AH: And you're about to go up there on stage and rock on this thing? B: Yeah, yeah, yeah. Pretty soon, yeah, like, fifteen minutes or so, my band is named Bong Lang Ruam Jai. Pretty good, though. Various Voices: It's Out of the Blocks. This is the CID, the Chinatown International District. One neighborhood, everybody's story. Leeching Tran: As you can see, we have a lot of variety of fruits and vegetables. You see some prickly fruits up here. We've got some rambutan, those come from Thailand. We've got some dragon fruit next to that, back there. Bitter melon, which, true to its name, is very bitter. Some different shapes and sizes of bamboo shoots here. My name is Leeching Tran. My parents actually own this Viet Wah supermarket. 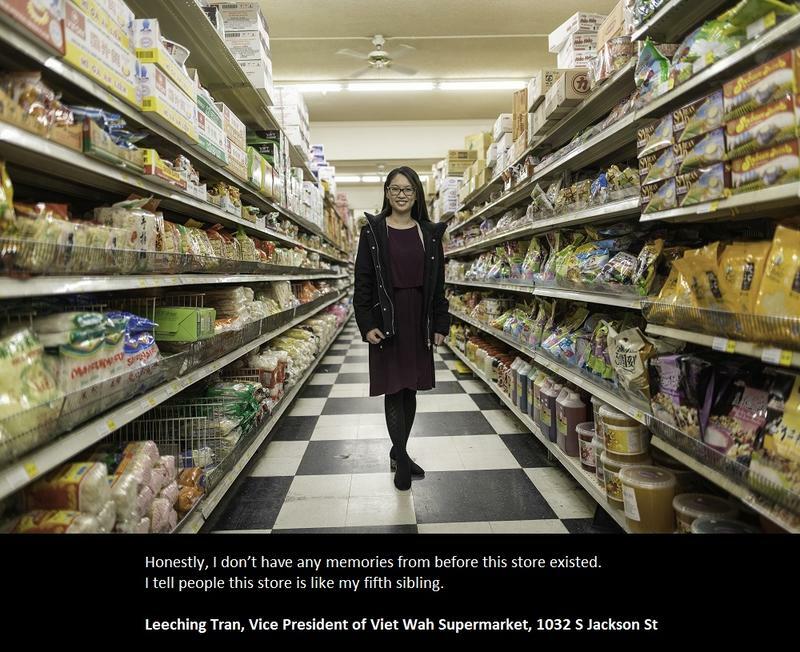 They started the company Viet Wah in 1981. So, my parents were born and raised in Vietnam, and they escaped after the war, and they both ended up in Seattle and they got married here, had my brothers and I all here in Seattle, and I'm born and raised here. AH: We're in the cookie aisle now. LT: Yes. This is...It's very nostalgic walking through the cookie aisle. These are snacks that I had growing up, so Hello Pandas and Pockys and those weird wafer cookies and things. That's what we had growing up. We didn't have too much of like, Oreos and Chips Ahoy and that kind of thing. This is childhood for me. Honestly, I don't have any memories from before this store existed. You know, I tell people this store's kind of like my fourth sibling—fifth sibling, sorry. It's just been a part of my life growing up. We would come here on the weekends. I remember, you know, bagging groceries as a kid, or I'd help my mom count the tills at the end of the day when we're closing up the store. So, it was very much a part of my life. It always has been and probably always will be. So, I am the Vice President of the company right now, working under my dad. Learning now as an adult to appreciate everything that my parents went through to give us the life that we have... It puts things into perspective. I just had my first baby a couple months ago, and just thinking about how the way that I'm raising him is so different than how my parents raised us, and the circumstances we are living under are wildly different. So, it's made me very appreciative of how we were brought up. AH: What did you name your baby? LT: His name is Wesley. AH: Do you think you're going to raise him up to be ready to be the next Vice President. LT: We'll see. It’s up to him what to do with his life. But, it would be pretty cool if he took over for the third generation. AH: Have you brought him in here yet? LT: Yes I did, actually! He made his very first trip to Viet Wah. This is silly but he has a little Instagram, so I hash-tagged "future CEO" on it. AH: So, we're here at the corner of King and Maynard, and we're going to walk up King Street. I see there's construction fencing around the building there. Tanya Woo: Yeah, so they started back in December. They've salvaged a lot of the historical essence of the building I guess. We have historical tax credits, so they're saving doors and wood trim and the staircase. AH: You've got investors and a design firm working on this. It's going to be low income housing up top and store-front retail space on the ground floor. Is that right? TW: Yeah, and parking in the basement. AH: You guys dug a lot of interesting stuff out of there today. TW: Like, you can see some mixers here and it looks like those are partial ovens and sinks. Everything has to be taken out of the building. So, this building is called the Louisa Hotel. It's gone through very many names. It's been the Hudson Hotel, the American Hotel. It was built in 1909. So, it first housed immigrants who were coming to Seattle for work. Either working for Alaskan canneries or for the railroad. But they would, all men, live in this building, and during that time, this building was a very happy place for them. They came here waiting for assignment, they had fun, there was food, there was comradery, family, and there was also a lot of night life. There was gambling, there was jazz clubs... It was all a good time back then. My name is Tanya Woo. My dad bought the building in 1963 for $160,000. My dad loved that building so much, he started a bakery in there. It was the first Chinese bakery in Seattle. Before then, you had to go to Portland or Vancouver, a three-hour drive, to get Chinese pastries. So, I remember the smell of pastries and helping parents and we were at the bakery every single day. AH: So, when your dad took over the building, a number of different businesses were in effect on the ground floor. TW: So, the hotel was vacant. But, yes we had Mon Hei Bakery, the first Chinese bakery. Then, we had Sakana Restaurant, which was also the first Chinese seafood restaurants. Lem's Pet Shop was there. Palace Gift Store, and herb shop was there. 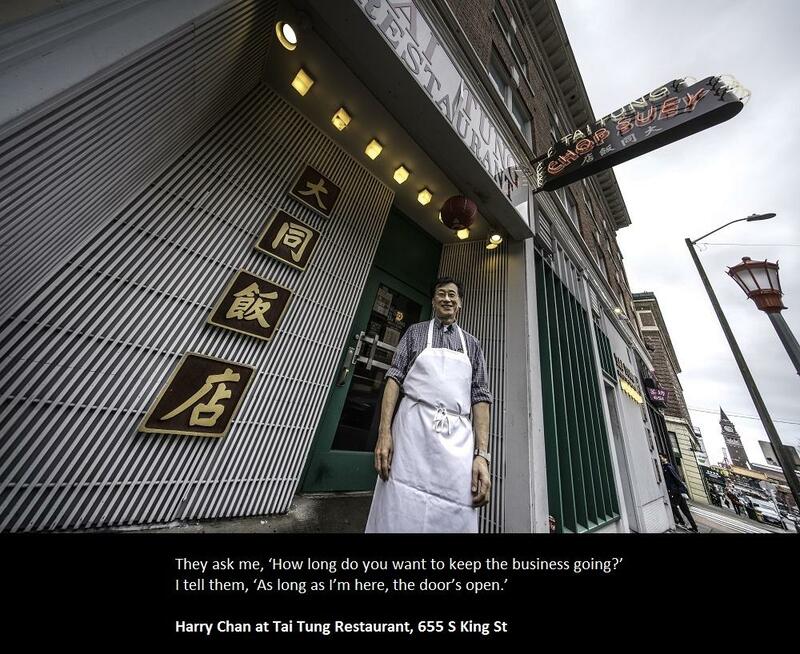 And a lot of these businesses were not only there for business, they were also the social centers of a lot of groups in Chinatown. AH: What year did the fire happen? TW: 2013. Christmas Eve. Chinatown is such a small community, so we knew all of the tenants of the building. They were all outside and they were crying because they had to evacuate immediately, they didn't know what was going on, but we were out there until eleven to midnight. And it’s still very emotional for everybody involved who were there that night. About a couple days later, the firefighters relented and allowed each business owners half an hour to go in there and grab their most valuable items: passports, money, records. I remember this lady, the grandmother of one of the business owners, and she was taking out a tea set, and she dropped a tea cup and it broke and she just started crying, right there. It was... it was kind of heartbreaking just to see. And so, we decided that we were going to get involved as part of our family legacy, to try to restore the building, to try to bring life back into it. My dad passed away when I was eighteen, but he absolutely loved that building and because he died when I was so young, I didn't really get to know him, and it's been really interesting so far. Going through the building, I am learning so much about the dad I never really got to know, and the history of my family. We found records from my great grandfather, love letters from my grandfather back to China, when he couldn’t bring back my grandmother. So, it's just...a story that I can’t wait to see what else we learn. AH: I guess your dad never could have had any reason to predict that you would end up sort of in this role as the champion for his building, right? What would you say to him, if you had the chance to speak with him again about your passion for keeping this building alive or bringing it back to life. TW: Oh my goodness. I sometimes go to the cemetery and I have these conversations in my head about what I'd say to him and what he'd say back. And I really don't know. I hope we're doing the right thing. We have an amazing team and we have an amazing family that's investing in this project and... would he be proud? We'll have to see what happens, but I'm very hopeful that the outcome will be good, and regardless, I think he would be proud. Curtis Marr: I am Curtis Marr. Eric Marr: I am Eric Marr, and I'm Curtis's brother. We are doing some suspension work on this 2007 GMC Denali. We also have a BMW in here that's leaking oil out of the bottom of the oil pad. CM: I'm pretty amazed. He knows a lot about cars. He has very good diagnosis skills. In some ways I almost feel like a doctor. A car comes in, and you have the task to figure out what's wrong with it. EM: Sometimes it takes a little bit, but he doesn’t give up. He just keeps going at it until he figures it out. 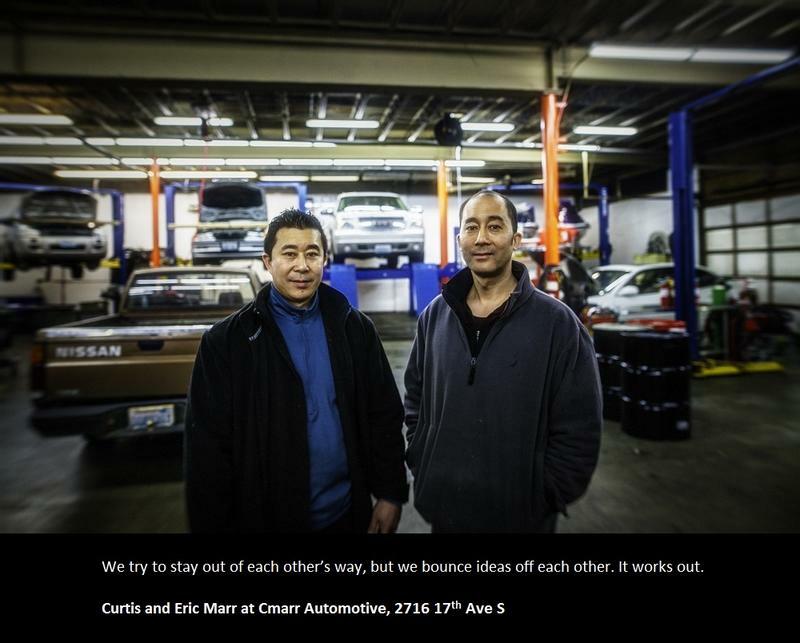 CM: Our business name is CMarr Automotive, 2716 17th Avenue South in Seattle. I went to school to be an automotive technician. EM: I went to school for business. CM: And um, we're familiar with the area. Grandparents came from China. 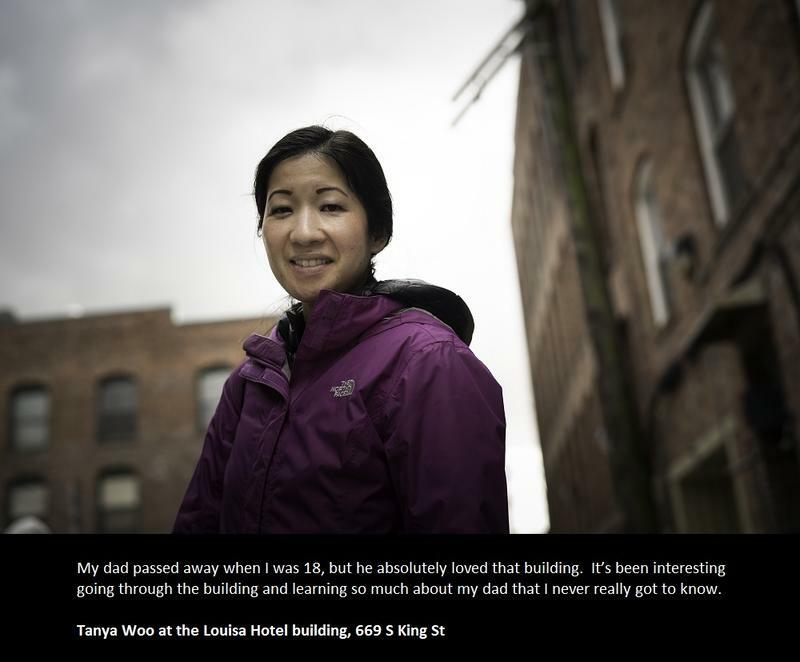 Had businesses—both of them—that they ran out of the International District years ago. EM: And I guess we just followed in our grandparents' footsteps and opened up a small business too. AH: Tell me what it's like to go into business with a sibling. Does that make things easier or harder? EM: For us, it actually works out. We try to stay out of each other's way, but we kind of bounce our ideas off each other. So far it's been successful. CM: We have full control over how the business works, and get the full, rewarding benefit when we fix cars and make customers happy. Bailey Lee: "Poke" actually is a Hawaiian word to mean "to cube." The fish is cut into cubes, and what the Hawaiians used to do when they were fishing was this was a light snack, where they would season it with Hawaiian salt with some seaweed and some onions, and they would eat it right on the shore or after fishing. My name is Bailey Lee. The name of this establishment is Go Poke, Seattle, Washington, 980104. 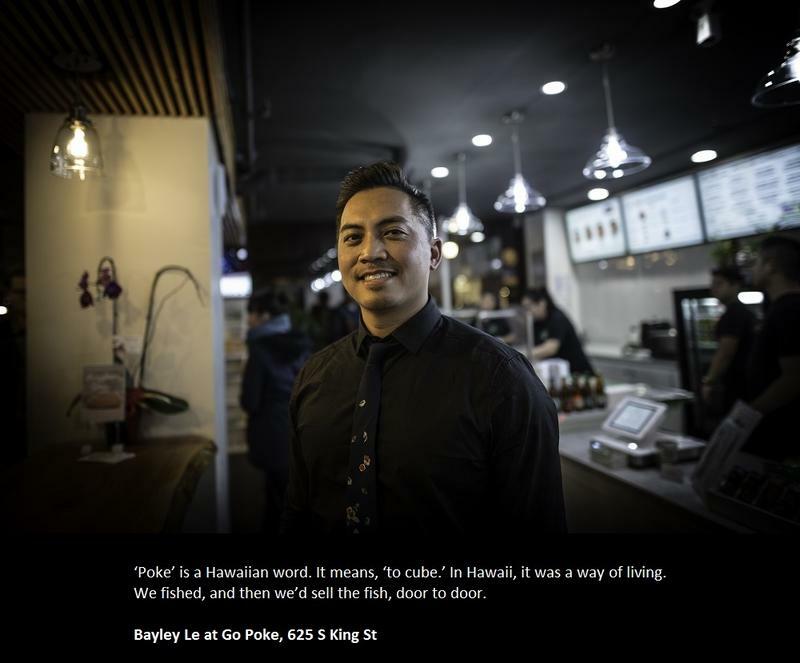 Go Poke is a Hawaiian restaurant that focuses on authentic Hawaiian poke, and poke is raw, marinated fish, fresh ahi tuna, fresh king salmon, and also even octopus, and you also get a variety of sides, like cucumbers, ginger. So, it's very similar to chipotle style, where it is a fast-casual restaurant, and our specialty is allowing you to create your own rice bowls with the poke. When my parents were immigrants to the United States, they were fleeing the Vietnam War. During this time, my dad and his family, friends, cousins, they started fishing in Hawaii, and they made that a living. Then, they brought the family out there and then we grew up there. That was a way of living, you know, we fished, and then the fish got brought home, and we would sell the fish by pounds, door to door. And then whatever was left over, we would make poke out of it, and then we would sell that door to door. When we graduated high school, one by one, we decided, "Hey, let's not do fishing, let's not sell poke, let's not sell fish anymore. Let's look for opportunities in the mainland." When we moved to Seattle, we really missed Hawaiian food. Poke. At that time, we were just thinking, like, "Oh, wouldn't it be cool if somebody opened up here so that we could have it." Then, I think, 2015 we had a revelation, like, "Hey, why are we waiting around for someone to do it when we knew how to do it when we were kids. Why don't we do it?" Opening day is still—you know, fourteen months later—is still probably the best sales day we've ever had. We had lines out the door for hours, and we had line dancing and we had hula dancing, we had lei making, Hawaiian music, a DJ. To this day, we still talk about opening day. When someone comes in, we say "aloha" and when someone leaves we say "aloha." Making them feel like they're welcome as family, and I think that makes us most proud is, like I said, whether they're Hawaiians, first-timers, hundredth-timers to poke, I think they're all enjoying their experience. Betty Luke : [speaking Chinese dialect]. Think about it as notes of a song. AH: And say what that means? BL: It's good wishes for the New Year. I’m Betty Luke. I'm the youngest of the six children. MY: I'm Marge Young, and I am the middle sister of three of Wing Luke's sisters. BL: Wing Luke was the oldest, and I was the youngest. There was actually seventeen years between us. AH: Your brother, Wing Luke, came here, didn’t know English, demonstrated himself to be an exemplary student, next thing you know he was taking on leadership roles here and there informally, and then formally as a politician—city councilman. BL: Yes. When he was elected, he was elected in the biggest vote margin ever in the history of the city. He had a combination of incredibly intelligent mind that he could state something that even those who don't agree with him had to laugh. Reporters loved him. Absolutely loved him, because he was a fresh story. One time, a mayor from Ireland was visiting. It happened that both...his name was also Luke. And so there was a story in the paper, and he brought the other Luke around to these different bars because it was St. Patrick's Day. Not to drink, but to sing. He loved Irish ballads, he just loved them. I still remember his voice coming in the house singing "Oh Danny Boy." AH: It sounds like he died an untimely death. How old was he when he passed away? And tell me the story of how you guys heard the news and what happened with your family then. BL: It was horrible. I heard it on the radio that his plane was missing. It was a Cessna four passenger coming across the Cascade Mountains, and to me it just boggles my mind to think that May 10th they were caught in a snowstorm. And one of the groups that was searching, there were actually two major groups that did the fundraising: the Asian community group, the other was the business and legal group, because in those days the search protocol for down planes was two days, period. To be able to hire extra helicopters, the rate was a dollar an hour, and so both groups raised money, and what resulted was the largest plane search in the history of the country. We did not find the plane until three years later. It had crashed into a waterfall. AH: When his plane went down, so many people came forth with funds to help in the search that that extra money was taken to create the Wing Luke Museum. BL: With the Asian fund. This is a three story museum, and has many, many parts. There is one large room that is a permanent historic section. On one wall is an immigration timeline. On the opposite wall is a timeline of discriminatory laws against Asians. 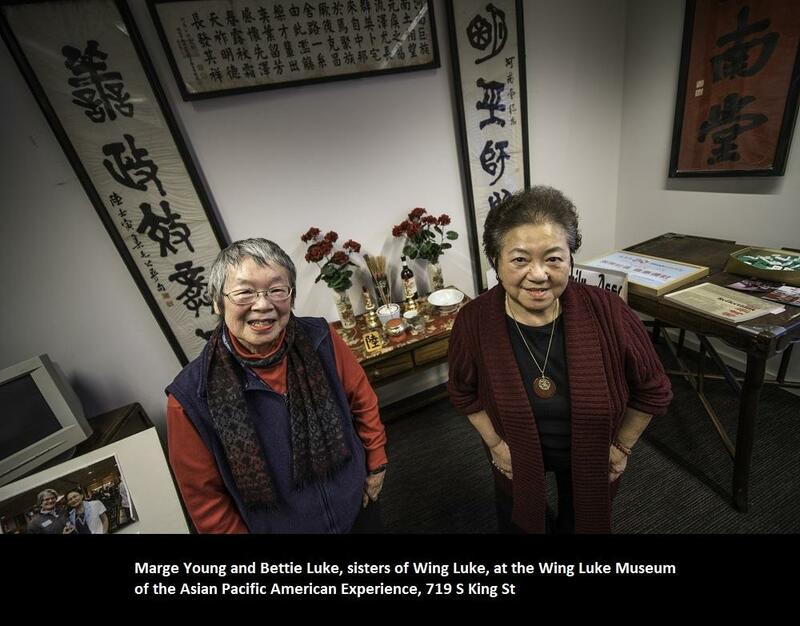 We're the only museum that umbrellas all different Asian-Pacific Islander groups, often who have never been featured in an exhibit. AH: What a wonderful thing came to fruition in the wake of the tragedy of your brother's death. He simultaneously made this possible, and will never be able to see what he ended up making possible. BL: It's like the yin and yang of the museum. 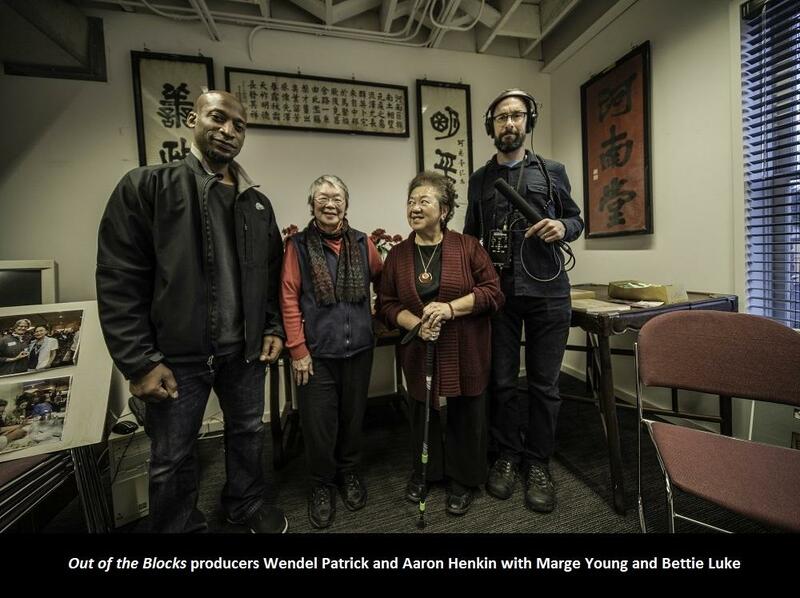 Various Voices: You’ve been listening to Out of the Blocks, produced by Aaron Henkin and Wendel Patrick, in collaboration with KUOW. Special thanks to KUOW’s Matt Martin, Caroline Chamberlin, Jim Gates, and WYPR’s Katie Marquette. Aaron and Wendel wanted to thank all of us who took a leap of face and shared our stories and our lives. 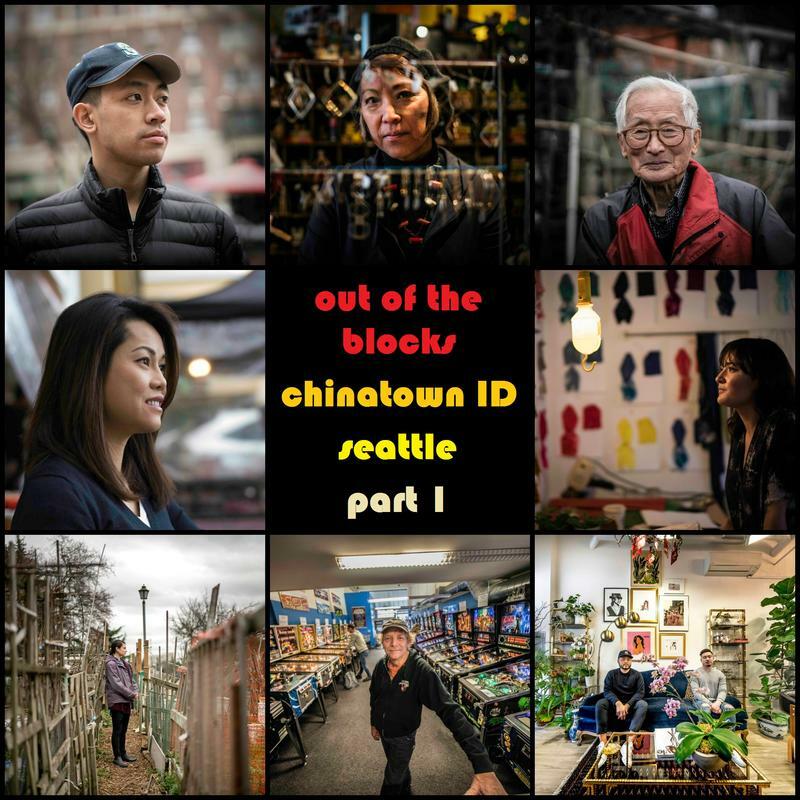 From WYPR and PRX, this is the CID — Chinatown International District, Seattle, Washington signing off. AH: Hi guys, Aaron here, hopping on the mic for a second as we get ready to wrap up to say a very special thank you to the NEA—the National Endowment for the Arts. They have made this episode possible with their generous support as they have put their trust in us to continue sharing our documentary model with other cities across the country. Next stop: Detroit, Michigan. We are headed there in April. In the meantime, we have another great Baltimore block that we're looking forward to bringing you along to—the 200 block of West Read Street. The locals very lovingly refer to this block as Drunk Sesame Street. Stay tuned for that one. 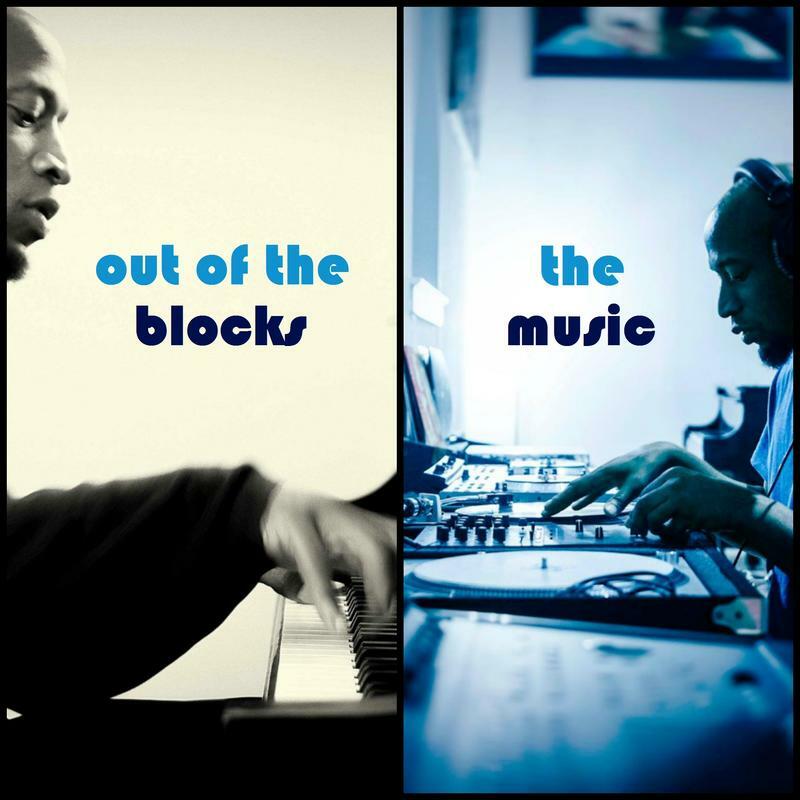 Drop us a review on Apple Podcasts if you're so inclined, tell a friend about Out of the Blocks, and we will do it again soon. Thanks for listening. Out of the Blocks is produced with grant funding from the Corporation for Public Broadcasting, and from the Cohen Opportunity Fund, the William G. Baker Jr. Memorial Fund, Sig and Barbara Shapiro, Patricia and Mark Joseph, Jonathan Melnick, the Andy and Sauna Brooks Family Foundation, the Hoffberger Foundation, Associated Jewish Charities, the John J. Leighty Foundation, the Kenneth S. Batty Charitable Trust, and the MuseWeb Foundation.